Come past Small Space from the 10th of November to view new work by local artist Roosaleen Ryan of Mamoru Jewellery in the window. Titled "the Garden State"
"With 32 Botanic Gardens, 124 parks within 5km of the CBD, and no less than 60,000 trees, Melburnians need not crave nature for long before being able to witness its glory in full. But for those of us who may never own a garden to work in ourselves, taking fragments of the beauty that adorns the streets back home with us can be equally as satisfying and romantic. 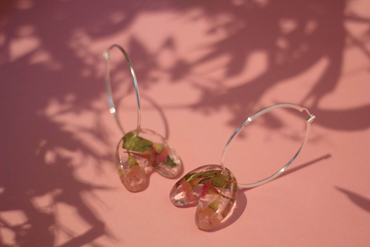 The Garden State is an exhibition of new resin jewellery by local artist Rosaleen Ryan of MAMORU that celebrates these foraged flora and gives thanks to the gardens of Melbourne. 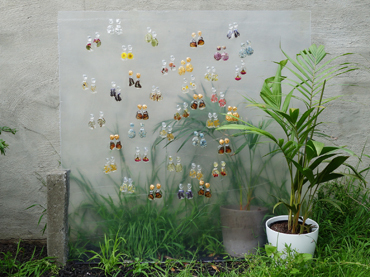 The jewellery collection is inspired by these public spaces, feral fruit, and urban flora foraged. 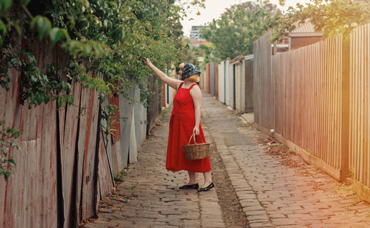 With all embedded materials collected in and around the Inner-North, The Garden State is a celebration of life in Melbourne’s springtime." The exhibition will run until the 30th of November and can be viewed in the window 24hours but looks particularly pretty at night. Opening hours Wed to Fri 10 to 5.30 and Sat 10 to 4.